The evolution of life on earth from simple matter is accepted as a fact by secular science. The Bible—and the evidence—show a much different picture. —Stephen J. Gould, in Evolution Now: A Century After Darwin, ed. John Maynard Smith (New York: Macmillan, 1982), p. 140. The evolution of life on earth from simple matter is accepted as a fact by secular science. Natural selection is claimed by evolutionists to support the belief that all life has emerged from a common ancestor over billions of years. Observational science has demonstrated that natural selection acts to decrease or conserve the amount of genetic information in a population. In order to turn an amoeba into an ape, there has to be an increase in genetic information. Despite this fact, evolutionists insist on the increasing complexity of life over time. To add to the problems of the evolutionary story, life must have evolved from nonliving chemicals. No one understands how this could have happened, but it is accepted as true regardless of any evidence. The Bible presents a very different picture. God created all living things according to their kind in a series of supernatural acts. All life came from these original kinds, not from a single ancestor. 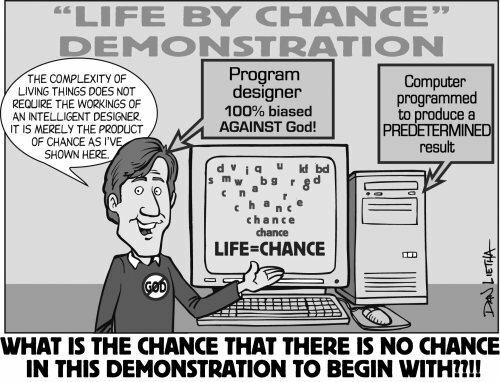 The change that is evident in the fossil record is the result of change by natural selection within the created kinds. Dogs have become different types of dogs, but have never produced anything other than dogs. Man is not the result of an evolutionary process, but was created in the image of God as described in the Bible. The fossil record is not the result of gradual change over billions of years, but the record of the global Flood and events following it. Evolutionists look to outer space to find life on distant planets and attempt to communicate with beings beyond the earth when God, the “Ultimate Being,” has already communicated to us through His Word. Among Christians, there is a wide variety of views on biological evolution. Many accept the naturalistic explanations of the universe forming from a big bang and the earth evolving from gas and dust in space, but they reject the evolution of living things on earth. Why accept naturalistic explanations—even though they conflict with the Bible—and then reject the same reasoning when it comes to living things? Others accept the naturalistic explanation for biological evolution but insist that God guided the process or filled in the gaps. Why would God have used the death of billions of animals to bring about the pinnacle of His creation—mankind—when He is capable of creating everything in an instant? Is that the type of God who revealed Himself in the Bible? Questions like these are not often considered by those Christians who accept that secular science has provided the answers to many of life’s questions. If we start from the Bible, we arrive at totally different conclusions. 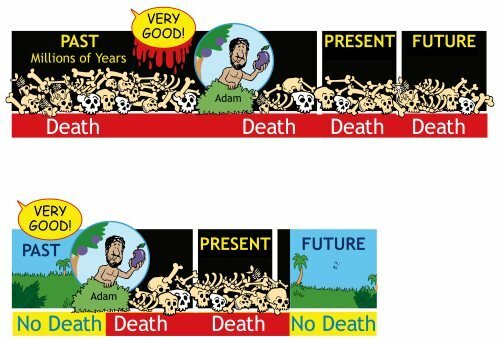 The story of evolution teaches that man is a product of death and suffering over billions of years (above). The Bible teaches that sin and death are products of mankind’s rebellion against God (below)—quite opposite doctrines. A plain reading of Scripture reveals that God created all living things in the span of three days. Not only that, but Genesis 1:29–30 tell us that all creatures were created as vegetarians. There was no death in God’s “very good” creation. It was not until after sin entered the world that death entered in as a consequence. Today, we live in a world that is marred by sin and we must keep that in mind as we interpret the evidence. The Garden of Eden was not planted by God on top of sedimentary layers filled with death, thorns, and disease (all found in the fossil record). God created a perfect world that had not yet been marred by sin. Mankind and the rest of creation is awaiting the day when they will be freed from that corruption ( Romans 8:20–22 ). The topic of biological evolution is a very broad topic that cannot be covered in detail in this chapter. The companion to this book, Evolution Exposed: Biology, covers these topics in a more thorough manner. Please refer to that book for an in-depth discussion on biological evolution. In order for us to begin the discussion of how amoebas are supposed to have evolved into apes, there is a more important question to ask. How did the first living thing come to be? Because modern science absolutely rejects the possibility of any supernatural influence, all life on earth must have come from nonliving matter. The story presented in the textbooks is that life evolved about 3.5 billion years ago from simple chemical interactions on the cooling earth. Experiments like those performed by Stanley Miller and Harold Urey are used to explain how life evolved from a primordial soup. These experiments are hailed as proof that life, somehow, appeared. There is little mention of the impossibility of such a transformation based on observational science. Instead, life is assumed to have appeared on a planet that is assumed to have formed from a collapsing nebula that is assumed to have formed from the big bang which is assumed to have occurred without a cause. If any of these links in the chain of assumptions breaks, the whole story of naturalism unravels. The term evolution is used quite loosely in most circles—including the textbooks. In order to have an intelligent conversation, it is important to define the terms. Evolution, in biological terms, refers to the idea that all organisms are related to one another through time. The tree of life started with a single organism that changed over time to produce every form of life that has existed on earth. All life on earth has come about through descent with modification from a single common ancestor (a hypothetical, primitive, single-celled organism). The process by which individuals possessing a set of traits that confer a survival advantage in a given environment tend to leave more offspring on average that survive to reproduce in the next generation. Natural selection is an observable process that falls into the category of operational science. We have observed mosquitoes, birds, and many microorganisms undergoing change in relatively short periods of time. New species have been observed to arise. Biblical creationists agree with evolutionists on most of the ideas associated with natural selection, except the idea that natural selection leads to molecules-to-man evolution. Evolutionary biologists assume, based on geologic interpretations, that there have been billions of years for this process to occur. But if long ages did not exist, the evolutionary theory cannot be true. Another requirement for molecules-to-man evolution, a mechanism for adding new information, is also assumed to exist—even though it has never been observed. Natural selection deletes genetic information from the population. If natural selection is the mechanism that explains the successive adaptations in the transformation of a fish to an amphibian, it must provide new genetic information. To produce the new bones, muscles, and tendons in the limbs requires an elaborate orchestration of biologic processes. The bones don’t only have to be present; they must develop at the right time in the embryo, have their shape and size predetermined by the DNA sequence, be attached to the correct tendons, ligaments, and blood vessels, attach to the bones of the pectoral girdle, and so on. The amount of information required for this seemingly simple transformation cannot be provided by a process that generally deletes information from the genome. Biblical creationists consider major structures to be part of the original design provided by God. Modifications to those structures (adaptations) occur due to genetic recombination, random mutations, and natural selection. These structures do not arise from the modification of similar structures of another kind of animal. The beak of the woodpecker, for example, did not arise from the beak of a theropod dinosaur ancestor; it was an originally designed structure. The difference in beak shapes among woodpeckers fits with the idea of natural selection leading to changes within a population of woodpeckers—within the created kind. The original organisms (and their descendants) created supernaturally by God as described in Genesis 1; these organisms reproduce only their own kind within the limits of preprogrammed information, but with great variation. Note: Since the original creation, organisms of one kind presumably cannot interbreed with a different kind, but individuals within a kind may have lost the ability (information) to interbreed due to the effects of the Curse. This concept distinguishes biblically-based thinking from evolutionary thinking. Evolutionists would suggest that the first single-celled organism evolved into different multi-celled organisms. Eventually, a fish evolved from one of these lines (supposedly a relative of the starfishes) and then the fish evolved into an amphibian. The amphibians gradually developed features that allowed them to move away from water and eventually became reptiles which then evolved into birds and mammals. Eventually, the primates evolved and from that group the first humans emerged between 2 million and 200,000 years ago (depending on which source you put your faith in). The fossil record, DNA, and other biological molecules are used to support this idea. When we look at what the Bible describes in Genesis, the idea of evolution from one kind of organism to another does not exist. The Bible describes organisms that were created after their own kind. The biblical kinds correspond roughly to the family level using today’s classification scheme. Natural selection occurs within the kinds but could never produce a new kind of organism. One of the most problematic spots in the explanation of the evolution of life on earth is what is known as the Cambrian Explosion. At this point in the fossil record, supposedly 540 million years ago, all of the major body plans of organisms appear quite suddenly. There are no ancestors in the lower rock layers, so it appears as though there were an explosion of evolutionary activity. This would seem to be contrary to the theory of evolution, but is explained by the presence of alleged dramatic climate changes which led to an increased rate of evolution. The plastic theory of evolution is able to accommodate rapid change or no change at all—the evidence will always support the theory! This illustration shows a representation of some of the forms that appeared very suddenly in the fossil record during the period known as the Cambrian Explosion. In the creationist model, these animals represent descendants of the original created kinds that became extinct during the Flood of Genesis. Gradual evolution cannot account for the sudden appearance of so many types of life. 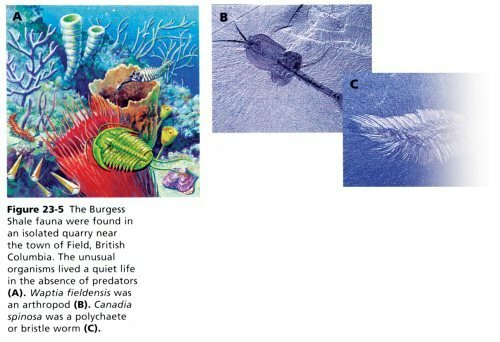 Missing from the layers of rock, at any level, are the transitional forms that document how the relatively simple organisms evolved into relatively complex arthropods. 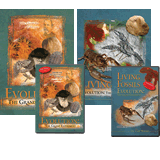 When Darwin developed his theory, he expected the fossil record to reveal the missing transitional forms. Over the last 150 years, there has been little in the way of transitional forms revealed. If fish had truly evolved into amphibians over millions of years we would expect to find lots of variations that are partially fish and partially amphibian in the fossil record. There should be a clear line of ancestry from fish to amphibian with countless side-branches of creatures that became extinct. Instead, we find many fish and many amphibians with a few examples of possible transitions. For example, the recently discovered Tiktaalik is hailed as a clear transition by evolutionists. However, this is simply a fish adapted to living in shallow water. Such variety in the fishes is expected when we start from the Bible and consider the creativity of God. Because evolutionists believe fish evolved into amphibians, they interpret Tiktaalik as part of that transition. Despite the fact that the ancestors often appear higher in the rock layers than their descendants, the status of transition is claimed. Have you seen a dinosaur lately? You likely saw one out the window today—as it fluttered by. Birds represent living dinosaurs according to many evolutionists. The theropod dinosaurs grew feathers on their arms and evolved into the many birds we see today. There are those who reject this claim but many dinosaurs are now shown with feathers despite the fact that no fossils with feathers have been found. Those fossils that have feathers have been shown to be frauds or identified as true birds. From a biblical perspective, birds were created before dinosaurs so there is no way to reconcile the evolutionary account with the Bible. Drawing feathers on a dinosaur does not make it a bird! The fibers on Sinosauropteryx have been determined to be collagen fibers, not protofeathers. Even if dinosaurs with feathers were found, this would merely be an example of a feathered reptile. The Bible teaches that birds and land animals are separate creations—one did not evolve into another. When the phrase “human evolution” is used, this is probably one of the first images to pop into people’s minds. Despite its iconic status and widespread use, it is not based on factual evidence, but on imagination. The myth of transitional forms is very evident when we approach the subject of human evolution. Evolutionists would have us believe that all apes share a common ancestor. The textbooks present humans arising from this common ancestor over 4 million years ago. Whether this was in Africa or around the world simultaneously has not been determined, let alone which fossil represents the ancestor of modern humans. An examination of the fossils that are proposed as human ancestors, or at least along the branch that led to humans, shows many specimens that overlap in evolutionary time, as well as gaps of millions of years. There is no consensus on the path to humans, and any representation of the lineage is highly subjective. In the biblical creationist model, these specimens either represent some type of extinct ape, or groups of humans. The moral implications of the evolutionary philosophy that man is simply an advanced ape are increasingly manifested in our culture. If man is an ape, then the apelike or primal urges that we have for violence and sexuality can be excused as coming from our evolutionary history. Exercising those urges is contrary to the Christian doctrine of self-control. If we are just advanced apes and ultimately a product of random, cosmic accidents then there is no basis for what is right and wrong. The Bible, on the other hand, provides a clear basis for morality—we are all accountable to the Creator and His moral laws. Another attempt to cut the Creator out of the picture involves alien life. The search for life on other planets in the universe is based on evolutionary assumptions. According to evolutionists, if life could evolve here on earth then it must have evolved in many different places in the universe. Billions of dollars are spent on determining where and when this life may have evolved. Popular culture reflects this belief in the many different science fiction stories where the alien life offers hope to humanity. Whether this hope is from technology or medical knowledge, these beings are seen as saviors of mankind in many cases. Rather than accepting the Savior revealed in the Bible many people put their hope in something for which there is not a shred of evidence. The belief in the evolution of life on the earth is simply in total contradiction to what the Bible presents. The fossil record and the observations concerning natural selection do not support the evolutionary worldview unless there is a prior commitment to uphold a belief system. Starting with the truth in God’s Word, we must reject evolutionary thinking and the conclusions it leads us to. 8:1 Is evolution a “fact” of science? In the media, textbooks, and scientific literature, the occurrence of evolution has become a fact. The definition of the word evolution has also taken on two different meanings that are not equal. Evolution can be used in the sense of change in a species by natural selection. This is often referred to as microevolution and is accepted by evolutionists and creationists alike as good observational science. This type of evolution allows change within groups but not between groups. The other meaning of evolution involves the idea that all organisms on earth share a common ancestor by descent with modification. This idea is commonly referred to as macroevolution. 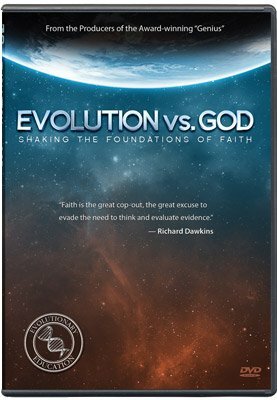 [Editors note: AiG does not endorse using the terms microevolution and macroevolution. It is not the amount of change that is different, but the type and direction of change that is different. These terms do not clarify that difference.] The two definitions are often used interchangeably. Typically, textbooks show that new species can form—evolution has occurred—so they argue that it is obvious that evolution, in the molecules-to-man sense, must have occurred. The problem is that just because natural selection and speciation have occurred (and there is strong evidence to support such claims), the claim that all life has evolved from a common ancestor is based on many assumptions that cannot be ultimately proven. Two intelligent people can arrive at different conclusions using the same evidence; so their starting assumption is the most important issue in discussing historical science. People believe the ideas of the evolutionary development of life on earth for many reasons: it is all that they have been taught and exposed to, they believe the evidence supports evolution, they do not want to be lumped with people who do not believe in evolution and are often considered to be less intelligent or backward, evolution has the stamp of approval from real scientists, and evolutionary history allows people to reject the idea of God and legitimize their own immorality. Evaluating the presuppositions behind belief in evolution makes for a much more productive discussion. Two intelligent people can arrive at different conclusions using the same evidence; so their starting assumption is the most important issue in discussing historical science. When we deal with the issue of origins, we must realize that no people were there to observe and record the events. When scientists discuss the origins of the universe, the earth, or life on earth, we must realize that the discussion is based on assumptions. These fallible assumptions make the conclusions of the discussion less valid than if the discussion were based on actual observation. Almost all biology books and textbooks written in the last two generations have been written as if these presuppositions were true. Evolutionists often claim that creation is not scientific because of the unprovable assumptions that it is based on. The fact that evolution is based on its own set of unprovable, untestable, and unfalsifiable assumptions is often unrecognized in the scientific community. Within the scientific literature, the mathematical and chemical impossibilities of the origin of the universe and life on earth are recognized. Many notable scientists, including Sir Fred Hoyle and Sir Francis Crick, have gone so far as to suggest that life originated on other planets or was brought to earth by an intelligent being. These ideas are no more testable than special creation but avoid invoking God as our Creator. 8:2 Is natural selection the same thing as evolution? Natural selection is generally described as the mechanism that is responsible for molecules-to-man evolution. From a creationist perspective, natural selection is a process whereby organisms possessing specific characteristics survive better than others in a given environment. There is no doubt that natural selection can change the genetic make-up of populations, but is that change able to turn one kind of organism into another? Natural selection involves a loss of genetic information and, therefore, cannot be used to explain how all of the life-forms on earth came to be. The idea of natural selection was first published by Edward Blyth—a creationist. He suggested that God had created the original kinds, and natural selection acted to conserve, rather than originate, new kinds. Darwin popularized the idea of natural selection acting to create new forms of life over time in the absence of God. Natural selection can be seen as a mechanism that God used to allow organisms to adapt to changing environments in a sin-cursed world. After death entered the world as the penalty for Adam’s sin, animals with detrimental genetic changes would be removed from the population and preserve the original kinds. Evolutionists view the history of life as a single branching tree where all life has come from a common ancestor. Creationists view the history of life as an orchard of trees, each representing one created kind. Natural selection allows organisms to adapt to their environment, but within the bounds of the kind. Illustration used with permission from Dr. Kurt Wise and Creation Science Fellowship of Pittsburgh from the 1990 ICC Proceedings, Bob Walsh editor, vol. 2, p. 358. Using dogs as a simplified example, we could start with two dogs that had medium-length fur. Let L represent the long-fur gene and S represent the short-fur gene. By breeding two dogs with genes for medium fur (LS x LS) we could produce dogs with a variety of fur length (SS=short, LS=medium, LL=long). If we placed all of these dogs in a cold environment, the long fur would provide an advantage. If all of the short-fur genes (S) were eliminated from the population by natural selection, this would be an advantage to the population. However, if the climate became warmer then there would be no way (other than a mutation of the L gene) to produce short fur—that information was lost from the population. Natural selection can select for a trait and decrease information, but it cannot provide new traits or information. We have observed the change in dogs over time, but that doesn’t mean that evolution has occurred. 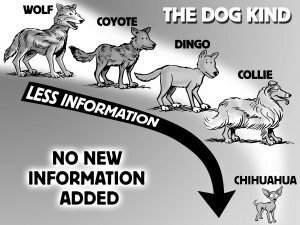 You can breed wolves to get to chihuahuas, but you can’t breed chihuahuas to get wolves—variation in the genetic information has been lost. Darwin used this type of change as evidence without an understanding of the limits of genetic change that are known today. A similar example occurs with bacteria and antibiotic resistance. Bacteria can become resistant to antibiotics by losing genetic information or swapping genetic information with other bacteria that have the resistance. Antibiotics generally bind to a protein in the bacterium to block its function, eventually causing the bacterium to die. If there is a mutation in the DNA which causes the protein to have a different shape, the antibiotic cannot bind to it and the bacterium lives. To become resistant, the bacterium has lost the information to make the correctly shaped protein. When it is required to compete with other bacteria in the absence of the antibiotic it is less fit and is eliminated from the population. Back to the dogs, there was likely one pair of the dog kind aboard the Ark. As they stepped out into the environment, the process of speciation began. In the last 4,300 years natural selection has acted on the genetic variation produced by breeding to produce the different varieties of dogs we see around the world today. However, that variation has only led to different types of dogs, never animals of a different kind. The speciation we observe involves a loss of characteristics and information, not the increase in information required to explain molecules-to-man evolution. Natural selection cannot be the driving force of evolution because it results in a decrease of information. 8:3 Are mutations part of the “engine” of evolution? This article details the common mechanisms of genetic mutation and explains how the mechanisms actually provide examples of a loss of information rather than the creation of new information necessary to explain molecules-to-man evolution. In evolutionary theory, mutations are described as the mechanism that fuels the engine of natural selection, creating new organisms as a result. However, most mutations are either neutral or cause a loss of information in the genetic code of an individual. Evolution teaches that mutations have accumulated over millions of years to increase the complexity of organisms on the earth. The Bible teaches that, as a result of Adam’s sin, all of creation is in a downward slide—including the genetic information that is in every living cell. The law against marrying close relations was not given to Israel until Leviticus 18 . Up to this point, the accumulation of genetic mistakes was apparently not significant enough to cause genetic disorders in the offspring of close family members. Today, with thousands of years of accumulated genetic mistakes in the human gene pool, intermarriage would be much more likely to produce children with genetic disorders. So it seems that the explanation of a genetic degradation since the Curse of Adam actually fits the evidence better than the evolution model of increasing complexity. 8:4 Life from life . . . or not? Darwin did not directly mention the idea of chemical evolution, but it is a natural extension of the logic of naturalism. Thomas Huxley, known as “Darwin’s bulldog,” boldly proclaimed the ability of life to come from nonlife. The idea of life coming from nonlife, spontaneous generation, was a popular idea from the time of the Greek philosophers. Louis Pasteur had performed experiments that showed spontaneous generation was not possible; so Huxley called the idea of the origin of life “abiogenesis” and said the evolution of protoplasm from nonliving matter had happened only in the early earth and could no longer be observed. This fact seems to disqualify it from scientific study. From studying the Bible, we should not expect to see life coming from nonliving matter since God ceased His creative activity after Day Six of creation. So, evolutionists accept that spontaneous generation happened to get life started, but it can’t happen today—a clearly fallacious argument that is necessary to support evolution. Scientists tried to show that Pasteur’s work was wrong, but the many practical applications of the idea forced scientists to abandon the idea of spontaneous generation. The work of Rudolf Virchow helped to confirm that all cells come from preexisting cells, not chemical imbalances. Still needing a mechanism to create life from matter, Huxley and Ernst Haeckel described a group of organisms between matter and cells. They found what they were looking for (because they had decided beforehand what it would look like), but it was later shown to be a simple mixture of chemicals and seawater. As these men were looking for the origin of life, they had no idea of the complexity of even the simplest cells. Each new discovery at the genetic and molecular level just makes it all the more evident that life did not spontaneously create itself—it had a Creator. 8:5 Can natural processes explain the origin of life? Some evolutionists, realizing the improbability of the spontaneous generation of life, suggest that life started somewhere else in the universe and arrived on earth somehow. The problem with this idea is that it cannot be tested, and it just pushes the problem from earth to another planet. Experiments conducted by Stanley Miller in the early 1950s produced some of the basic building blocks of life, but what conclusions can be drawn from the experiments? Relying on an intelligently designed procedure and apparatus, Miller succeeded in producing a few of the 20 amino acids found in living things. One of the major problems for the origin of life is the presence of oxygen. Oxygen would tend to destroy the organic compounds needed for life, but if oxygen were absent, the atmosphere would lack an ozone layer to shield the compounds from ultraviolet rays—a Catch-22 for evolutionists. Miller excluded oxygen from his experiment, though today the evidence points to the presence of oxygen in the atmosphere throughout earth’s history. Starting in water is also a problem since water tends to break the bonds of some amino acids and prevents them from forming chains. Miller isolated the products in order to avoid this destructive reaction. What about information? Every living cell contains a code (A-T, C-G sequence) that originates from a sender (DNA) and is passed to a receiver (RNA) that translates the meaning of the code to produce a protein that is intended to be used by the cell for various functions. If any of the pieces is missing, there is no information, and the cell cannot function properly. Evolutionary hypotheses must be able to explain the origin of this information system and provide a mechanism to increase the amount of information over time. No known natural law can provide a mechanism to accomplish this task. DNA is an amazingly efficient storage device. A one-square-inch chip of DNA could store the information in over 7 billion Bibles—millions of times better than current technology. Biblical creationists have no trouble explaining the presence of such complex information—it was created by the most intelligent Being in the universe. Evolutionists often claim that, given enough time, evolution was certain to happen. Consider that Bradley and Thaxton calculated the formation of a 100-amino-acid protein assembling by random chance to be 4.9x10191. It is generally accepted that any event with a probability beyond 1x1050 is impossible, so we must conclude that evolution, requiring thousands of times this amount of complexity, is not likely to occur even if the entire universe were full of organic precursors. Naturalism and materialism can offer no realistic method for the origin of life on earth. In 1977 Carl Woese first identified what he called a third domain of life, named archaea, based on ribosomal RNA (rRNA) sequence comparisons. The other two domains of life are eubacteria (true bacteria, prokaryotes) and eukarya (protists, fungi, plants, animals, and humans). Archaea share some physical characteristics with eubacteria but tend to live in more extreme environments, such as hot springs and high-salt environments. These extreme environments were believed to be present on early earth; hence archaea were thought to be the ancestor to both eubacteria and eukarya. However, further analyses of archaea showed them to be genetically and biochemically quite different from eubacteria, and they are no longer believed to be ancestral to eubacteria. Archaea are actually more genetically similar to eukaryotes than eubacteria and are often represented as a “sister” to eukarya on evolutionary trees of life. Eukarya have genes that appear to have come from both archaea and eubacteria, and so a genome fusion has been proposed. Archaea have given eukarya their informational genes (genes for transcription, translation, etc. ), and eubacteria have given eukarya their operational genes (genes for amino acid biosynthesis, fat biosynthesis, etc.). Rather than an evolutionary “tree” of life, a “ring” of life has been suggested. The archaea and eubacteria (possibly multiple ones) fused using the processes of endosymbiosis and lateral gene transfer to give rise to eukarya. A subheading in a recent article discussing the challenges of determining evolutionary relationships among these three groups says it well: “More good theories for eukaryotic origins than good data.” The scientists are so locked into their evolutionary assumptions that they must keep reinterpreting the data to fit their theories. If they would interpret their data in light of the truth found in the Bible, they would find that the data fits the creation model much better. God created many individual kinds of archaea, eubacteria, and eukarya. Through the processes of natural selection and speciation, the many different bacterial, plant, and animal species we have today have developed. The common traits seen among these living organisms point to a common designer not a common ancestor. 8:7 What grows on evolution’s tree? Evolutionists use the concept of the tree of life to show how all life on earth originated with a single common ancestor. The evidence for the branching tree cannot be found in the fossil record where there are many gaps and reversals. Textbooks present this tree as fact and the evolutionary indoctrination continues. The falsity of the tree is most evident in the “Cambrian Explosion.” In these rock layers, the majority of body plans (phyla) appear completely formed without evidence of their ancestry in the layers below. There have been no new phyla since the Cambrian Period when they all appear suddenly. The fossil record stands as a firm testimony to the creation of life, not its evolution by natural processes. 8:8 Gone fishin’ for a missing link? 8:9 What really happened to the dinosaurs? According to evolutionists, dinosaurs evolved 235 million years ago and dominated the landscape until 65 million years ago when they abruptly and mysteriously died out. According to a biblical perspective, dinosaurs were created on Day 6 of the Creation Week, and most became extinct as a result of the Flood described in Genesis. Not all dinosaurs died in the Flood—they would have been among the many kinds of animals on the Ark. Those that got off the Ark have since become extinct. The history of the dinosaurs is not as complex as evolutionists make it out to be. The different views are a result of starting from a different set of assumptions. 8:11 Does this evolutionary claim have any legs? The origin of birds has always been a major problem for Darwinism, and even today little agreement exists about their evolution. One of the most difficult issues related to bird evolution is the evolution of feathers. Feathers are complex, designed structures required for flight, and are today found only on birds. A literature review on the evolution of bird feathers showed that even though feathers are found as far back as the Cretaceous Period, including many well-preserved samples in amber, the fossil record fails to provide solid evidence for feather evolution. The implications of this major difficulty for Darwinism are discussed in this article. The structure of a feather is much more complex than it appears. Each feather contains a main shaft, barbs, and barbules on the barbs, which contain many small hooklets and grooves that act like Velcro® to hold the feather together. There are over a dozen types of feathers. The nervous system to control flight is amazingly complex. The complex system of brain, muscles, lungs, tendons, and feathers must have evolved all at once in an irreducibly complex system. Each part by itself would not be likely to provide a survival advantage. The sudden appearance of fully formed feathers in the fossil record supports the idea of special creation. Many evolutionists hypothesize that feathers actually evolved for insulation and were later exploited for flight by modification. Some disagree with this idea, and it is still contested. The origin of flight in evolutionary hypotheses ranges from tree-down gliders to ground-up flyers. As there is no evidence for either theory, the speculative debate continues. Feathers and bird bones are relatively abundant in the fossil record, with 79% of the 329 living families known from fossils. No transitional structures between scales, skin, and feathers are known from the fossil record, suggesting birds appeared suddenly—during Day Five of Creation Week. The complex differences between reptilian scales and bird feathers mean that a set of intermediate steps would have been needed, none of which is seen in the fossils. A hair-like follicle must have developed, making the evolutionary connection between hair and feathers more plausible. The problem is that this would not fit the other evolutionary evidence; so a story must be imagined to explain the miraculous development. The development from the billows-style lungs of reptiles to the unique features of the birds’ respiratory system is another insurmountable problem for Darwinists. The evidence clearly points to the amazing design of the Divine Creator of the Bible. 8:13 Did dinosaurs turn into birds? Many evolutionists would consider the birds at your bird feeder to be . . . dinosaurs! Far from being extinct, the dinosaurs simply evolved into the birds we see today. The Bible gives a different account. Birds were created “after their kind” on Day Five and then dinosaurs, from which birds allegedly evolved, were created on Day Six. The Bible must have the wrong order if the evolutionary story is true. Exactly which group of dinosaurs evolved into birds is disputed, but the idea has been popular among evolutionists for over 150 years. The most popular theory today suggests that the theropods, containing T. rex and Deinonychus, are the ancestors but there are many problems to overcome. Reptiles are cold-blooded, and birds are warmblooded. Birds would have to evolve highly complex mechanisms to regulate their body temperature. Some argue that dinosaurs were warm-blooded, but there is no convincing evidence for this claim. All dinosaurs are divided into the lizard-hipped saurischians and the bird-hipped ornithischians based on the structure of the pelvis. Ironically, it is the lizard-hipped theropods that are supposed to have given rise to the birds. A supposed commonality is the three-fingered hand of birds and theropods. Studying the embryological development of fingers has shown that digits 2, 3, and 4 develop in birds while digits 1, 2, and 3 develop in the theropods. 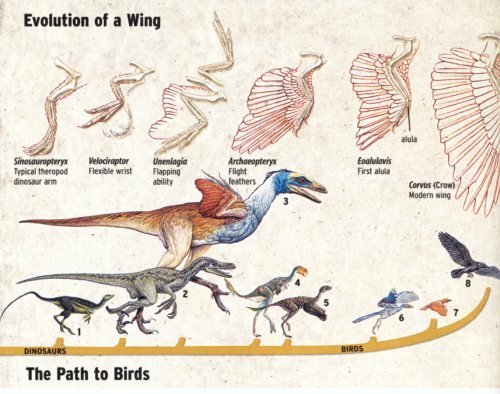 If birds evolved form theropods, the same pattern would be expected. Birds have a unique lung with a one-way air flow design. Reptiles have a billows-style lung where the air entering the lungs mixes with the air exiting. A well-preserved specimen of Sinosauropteryx revealed lungs with a diaphragm similar to a crocodile. Theropod lungs are not similar to bird lungs. 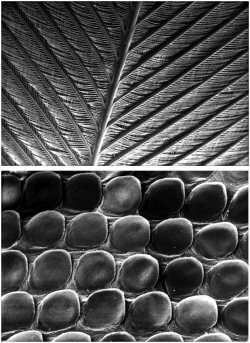 The many differences in the development of feathers and scales makes it clear that scales could not have been remodeled to form a feather. Feathers and hair are much more closely related in development. Birds are the only living organisms with feathers, and no dinosaurs have been found with feathers. Fossils of Sinosauropteryx have been identified with structures called protofeathers, but these have been determined to be collagen fibers and bear little resemblance to feathers in the first place. Fossils have been found with scales, but no feathers. In the Chinese fossil beds where the alleged bird ancestors are found, we also find true birds and groups that were once considered feathered dinosaurs but are now conceded to be flightless birds (Caudipteryx and Protarchaeopteryx). The only supposed theropod fossil found with feathers, Archaeoraptor, was found to be a fraud after being featured prominently in National Geographic in 1999. Even if a fossilized dinosaur were found with feathers, it would not shake the validity of the Bible, as the Bible does not mention such things. It would simply show design features common between birds and dinosaurs. We see such mosaic features in the platypus. What would be needed to support evolutionary ideas is an intermediate between a scale and a feather. Scales are simply folds of the skin while feathers are formed from a follicle, much like hair, and they have an incredibly complex structure. The vane is divided into rows of barbs, each having hundreds of barbules that interlock with tiny hooks and grooves. There is no similarity, but evolutionists continue to invent stories of how scales evolved into feathers. Archaeopteryx, considered to be a true bird, occurs in layers dated 20 million years older than its alleged ancestors. The claws, teeth, and long tail are often cited as support for its state as a transition between reptiles and birds. However, ostriches and juvenile hoatzins have fingers, and the extinct Hesperornis had teeth. Regarding flight, there is no consensus on how flight evolved, and flying birds are alleged to occur before flightless birds such as penguins. Theropods have large hind limbs and tails and very small forelimbs—exactly the opposite of what would be ideal for flight. Covering drawings of theropods with feathers will not make them fly. 8:14 Did humans really evolve from apelike creatures? Many popular magazines and television programs show evidence purportedly proving that humans evolved from an apelike ancestor. Is the evidence real, or are they making apes out of men and men out of apes? Starting from biblical assumptions, we see clearly that God made man in His image and did not use evolution. Some Christians who accept evolution say that man’s soul was created by God, but evolution made the physical form. The evolutionary assumptions demand that man evolved from an apelike ancestor and discount biblical authority. Paleoanthropologists don’t ask if man evolved from apes, but which apes he evolved from. The fossil evidence of hominids (alleged human ancestors) is extremely limited, and very few people get to see the actual fossils. Most studies are done from casts of the fossils or pictures. And because jaws and teeth are the most commonly preserved primate fossils, these become a key part of the interpretations. The fraudulent Nebraska Man, including his family and livestock, was identified and drawn based on a single tooth, which was later found to be from an extinct pig. Skull anatomy is also important, since brain capacity and facial features are used to demonstrate the supposed human-like features in some ape fossils. Leg and hip bones are important in demonstrating how the hominids walked. Those that walked upright are more human than those that didn’t. To make an apelike human ancestor appear out of the fossil record, paleoanthropologists do one of three things. First, they combine pieces from an ape fossil and a human fossil and call it a hominid ancestor. This happened in the case of Piltdown man, which was identified as a hoax after being promoted as man’s ancestor for 50 years. The second way is to emphasize the ape features of a human fossil, such as oversized jaws, sloping foreheads, and other features that are found within the range of human variation. Finally, they emphasize the human features on an ape fossil. This is evident in the fossil “Lucy,” an Australopithecus afarensis specimen. Even though A. afarensis hips don’t support the idea that they walked upright and the foot bones are curved like an ape’s, it is usually shown standing with human feet—a blatant misrepresentation of the fossil evidence. Humans are the result of either a cosmic accident orchestrated by time and chance or the special creative act of God. Evolutionists once viewed Neanderthals as dumb, cave-dwelling brutes that were less than human, but creationists have always argued that they were fully human. Neanderthals lived in very harsh conditions where disease and nutrition may have produced some of the skeletal features seen, and many evolutionists are beginning to accept the creationist view of Neanderthals as an extinct human people group—not a missing link. Tragically, other human people groups have been considered missing links and treated in barbaric ways. African Negroes and Australian Aborigines were sometimes considered less evolved humans. A century ago, Darwin’s idea encouraged the slaughter of Aborigines, and some were even prepared as museum specimens. It also gave credence to Hitler’s plan to exterminate the “inferior” Jewish race. Piltdown man was thought to be a missing link for over 50 years before it was discovered to be a fraudulent combination of a human skull and an orangutan jaw. But because people wanted to believe evolution, they initially accepted the evidence without scientific scrutiny. The many different and dubious interpretations of Java man and Peking man (well documented in Bones of Contention by Martin Lubenow) are further evidence that people see what they believe in the fossils. Nebraska man was a hallmark in the Scopes Trial, but the tooth that inspired this image was later determined to be from an extinct pig. There is no need to look for missing links if man is classified as a monkey, as a 1993 display at the Australian National Museum depicted: the common behaviors in humans and various apes were set forward as evidence for the claim. Australopithecus, the genus of the infamous “Lucy” specimen, is one of the most cited examples of a missing link in human evolution. The problem is that australopithecine features are all apelike, despite the claim that they walked upright. Many depictions actually show human hands and feet when the evidence clearly indicates curved, apelike features. The fact that tools are found with some australopithecine fossils and that human fossils are found in strata directly underneath suggests that the tools may have been used on the apes, not by them. The extinct ape fossils may share characteristics with modern humans, but so do living apes. No evidence from the fossil record directly supports a transitional series from ape to human. Virtually every major discovery is later reinterpreted to fit a new version of evolution. People have always been people and apes have always been apes. Each was created according to the purpose and plan of God. Neanderthals are often portrayed as unintelligent cavemen in animal-skin clothing. Neanderthals were first thought to be subhuman, but that thought is beginning to change. In the creationist view, Neanderthals and Cro-Magnons were post-Flood people groups that resulted after the dispersion from Babel. Neanderthals were originally given the name Homo neanderthalensis and considered an ancestor to modern humans. Forty-four years after this biased classification, Neanderthals were reclassified as a human subspecies Homo sapiens neanderthalensis and described as nearly human. It has been claimed that they were unintelligent even though their brain capacity was larger than modern humans, and interpretations of their social habits vary from hunter to vegetarian. The idea that skeletal features of australopithecines are intermediate to humans and chimpanzees is an interpretation that comes from the assumption that chimps and humans have a common ancestor. Starting from a different assumption, that humans and chimps have a common Designer, the evidence points to a Creator using similar structures to perform similar functions. Neanderthals present a challenge to Christians who believe that soulless humans came before Adam. There is conclusive evidence that Neanderthals and humans lived at the same time. Recent discoveries of a humanlike hyoid bone, burial practices, musical instruments, weapons, and other signs of culture have started to shift the picture in even the evolutionists’ minds. Evidence of hybridization between humans and Neanderthals, DNA comparisons, and the indications that they lived together for 100,000 years of evolutionary time point to the fact that they were fully human. This evidence contradicts evolutionary assumptions and supports the biblical position that Neanderthals simply represent some of the variety that was programmed into the human genome by our Creator. Evolutionists believe that a mass extinction, wiping out 90% of the planet’s species, occurred about 250 million years ago. The presence of nine major extinctions has led to much speculation about the cause. Some suggested causes of the Permian extinction are major meteorite impacts, increased volcanism, and depleted oxygen in the oceans. The meteorite impact supposedly caused major dust clouds that led to the collapse of food chains and eventually acute global warming, which wiped out most species. The theory using ocean oxygen levels is unsupported by real evidence. There is a large amount of volcanic activity in Siberia at this point in the strata, and some argue the asteroid evidence is better explained by these volcanoes. The same sort of sun-blocking chain reaction would result from massive volcanic activity. Creationists explain the apparent mass extinctions as distinct events or zones within the year of the Flood. The idea of asteroid impacts as a trigger for the Catastrophic Plate Tectonics Model developed by Dr. John Baumgardner is an interesting idea. The idea of a lot of small catastrophes over millions of years can all be encapsulated into the 371-day Flood. The evidence for a global flood is misinterpreted by the uniformitarian geologists. 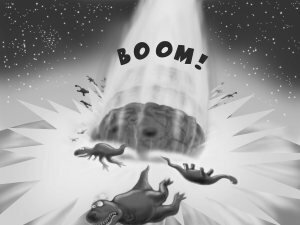 Many people believe that one or more of the major extinction events in evolutionary history occurred as a result of a meteorite hitting the earth. The creation model uses the Genesis Flood to explain the sudden disappearance of the majority of life on earth and the presence of billions of fossils buried in rock layers laid down by water. The disappearance of dinosaurs from the earth in a relatively short time has been a major puzzle for evolutionists. Their wide distribution and adaptation to many climates deepens the mystery. Studying extinctions is difficult because the classification and distribution of species is not well described. Up to nine major extinction events are supposedly preserved in the fossil record, the one at the end of the Cretaceous Period being the most extensive. Different theories on extinction range from one extreme to the other, including temperature, nutrition, and food supply. Lately, the meteorite extinction theory seems to be the most prevalent. A massive meteorite struck the earth, ejecting debris into the air that cooled the atmosphere. A layer of iridium concentration around the globe, the presence of shocked quartz, and many other types of evidence are supposed support for the theory. The cooling from the debris is alleged to have caused the extinction of the dinosaurs. A competing theory suggests that the data support a period of massive volcanic activity. Many types of evidence, including the iridium and quartz evidence, are given as support for the theory. The increased volcanic activity would have caused the same cooling effect, as well as releasing toxic gases and killing the dinosaurs. Opponents of each theory have valid arguments to refute one another. Creationists hold that the destruction of most of the dinosaurs, as well as most other life-forms, is accounted for by Noah’s Flood. Those dinosaurs that survived the Flood in the Ark have died off since then for various reasons. While there are still many unknowns in the fossil distribution, the presence of massive fossil graveyards, trackways that represent fleeing behavior, quickly deposited layers without channels forming, and other factors clearly point to a flood of global proportions. There are certain aspects of Flood geology that are not entirely understood, but the models are constantly being refined to accommodate these observations. The likelihood of volcanoes and/or meteorite collisions during the Flood explains the evidence for the two most popular secular theories adequately. In total, the Genesis Flood provides a satisfactory explanation for the extinction of a majority of the dinosaurs. 8:19 Did life come from outer space? The earth seems to have all of the conditions that make life possible. The fact that life evolved so quickly after the earth supposedly cooled from its molten state leads some evolutionists to consider the idea that life originated on another planet. With the billions of stars in the universe, there has to be a planet with earth-like conditions, or so they say. Mars and Europa (a moon of Jupiter) were once thought to have the ability to support life, but the lack of evidence is causing this idea to lose popularity among evolutionists. The attempt to identify planets in distant star systems has produced evidence of such exoplanets, but there are no specific details nor have we directly observed planets outside our solar system. For rocks to travel from another planet to earth carrying life, or vice versa, the rocks would have to be ejected with the force of a meteor impact, travel for extended periods of time, and be subjected to cosmic radiation. These factors make it highly unlikely that a life-form could make the trip. It is remotely possible that there may be bacterial life present on nearby planets if the life was “seeded” from earth. The SETI project, which listens for intelligent signals from outer space, and the recent Mars missions have failed to introduce any evidence. Astrobiology remains a science with no data to support it. 8:20 Are ETs and UFOs real? Science fiction programs depict creatures from distant planets, but many secular scientists believe we will one day discover life on other planets. The Search for Extra-Terrestrial Intelligence (SETI) is scanning the universe with radio telescopes to detect signals from intelligent aliens. 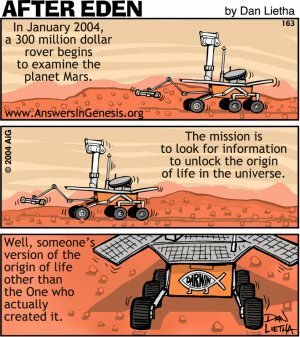 Is the idea of alien life biblical? The idea of extraterrestrial life stems from a belief that the earth is one of the planets where life could have evolved. With billions of planets, life is almost inevitable in an evolutionary worldview. From Scripture, we learn that God created the earth especially to be inhabited and that the other planets have a different purpose. If the alien life were intelligent then they could not be redeemed for their sin—they are not descendants of Adam. The Bible teaches that the first Adam rebelled against God and brought sin and death into the world. The inherited sin problem keeps all humans from being right with God. Christ was the perfect sacrifice, the Last Adam, and has paid the penalty for our sins by taking on human flesh and dying on the Cross. Christ died once for all. If there were human-like beings elsewhere in the universe who were not descended from Adam, Christ could not be the sacrifice for their sins. Some might suggest that Christ lived and died for each of those societies as well, but that is antibiblical as Christ died once for all. There is currently no evidence for extraterrestrial life. If it is inevitable that life evolved at many places in the universe, there should be advanced civilizations that evolved billions of years ago. We would expect that these advanced civilizations could have colonized our galaxy. The absence of life in the universe is called the Fermi paradox. What is paradox for evolution is actually a feature of the universe described in the Bible. Earth was designed for life and the other planets were not. Many people have seen unidentifiable objects flying in the sky, but these are just that—Unidentified Flying Objects. There are many phenomena in the atmosphere and space that can explain these sightings whether or not the individual can explain them or not. How these objects are interpreted depends on the worldview of the observer. From the biblical perspective these cannot be alien spacecraft, and there is no tangible evidence to support such a notion. So why is our culture so fixated on extraterrestrial life, and why does SETI spend millions of dollars searching for life? Discovering alien life would be seen as a vindication of evolution as it is a prediction of a naturalistic worldview. Some surely hope that aliens may have extensive knowledge to share with us—even the key to living forever. The belief in alien life has become a secular replacement for God. God is the healer of disease and the provider of wisdom and eternal life. The aliens are a way to replace God in this culture. The first chapter of Romans makes it clear that God has revealed himself through His creation. Many have rejected that message and exchanged the truth for a lie—man’s reasoning is set above the knowledge of God. 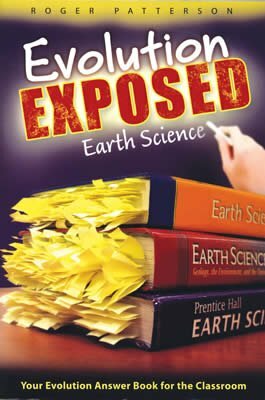 But when we start with the Bible, the evidence is consistent with an earth that is specially created. The magnificent beauty and size of a universe which is apparently devoid of life except for one little world where life abounds, is exactly what we would expect from a biblical worldview. Is antibiotic resistance the result of a gain in genetic information or a loss of genetic information? What mechanisms do scientists use to explain how mutations can produce new information to make organisms more complex, when all observed mutations cause a loss of information or no change at all? Can natural selection explain the origin of life on earth? If amino acids in nature come in left- and right-handed forms (enantiomers) how did life evolve to only have left-handed forms? Does the suggestion that chimpanzee and human DNA are similar necessarily mean that they had a common ancestor? Could it also be considered evidence for a common designer? Are there any alternative scientific explanations for humans evolving from apelike creatures? When we look at a car or an airplane, it is only logical to suggest that it was designed with the features that it has. The human body is much more intricate and complex than the most complex machines we can design. Why is it considered illogical to consider that the human body has a designer? It seems that whenever evidence challenges current evolutionary theory, the theory just changes to accept the new data, but the presuppositions don’t change. What evidence would scientists accept that would cast doubt on evolution itself? If evolution is not directed by a purpose, would it be safe to say that human existence is purposeless? What is the basis for truth and morality if human life is a by-product of evolutionary processes (random interactions of lifeless chemicals)? If there is absolutely no evidence for alien life in the universe, why are billions of dollars spent to look for it? Isn’t this looking for evidence to support a belief?